Ah, I did two wrongs here. I used a different gray that I thought would make a nice fading effect and I didn't thin it enough! Thanks masters for the insight! I will check the AK set..
Dont be afraid to overdo it at this stage. Make sure that if you are darkening then darken a lot and if you are putting in highlights they have to really be obvious. Your work is nearly lost because there is no contrast at all between the grey you had and the colours you used to post shade and highlight. That is why i told you to first post shade and highlight and then go over it again with the original colour. 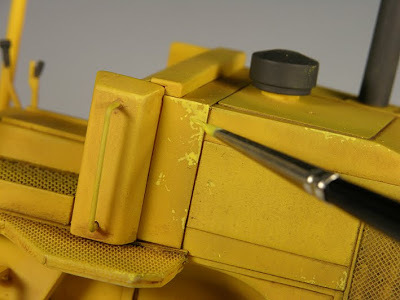 You will overdo the post shading and highlighting and then get the right amount of contrast you need when you respray with the original colour. That is why it has to be really thinned down so that you don;t get a coat but will blend in the colours gradually and you will have full control till you get the effect you need. Try it out it is quite easy. bcauchi wrote: Dont be afraid to overdo it at this stage. Make sure that if you are darkening then darken a lot and if you are putting in highlights they have to really be obvious. Your work is nearly lost because there is no contrast at all between the grey you had and the colours you used to post shade and highlight. That is why i told you to first post shade and highlight and then go over it again with the original colour. You will overdo the post shading and highlighting and then get the right amount of contrast you need when you respray with the original colour. That is why it has to be really thinned down so that you don;t get a coat but will blend in the colours gradually and you will have full control till you get the effect you need. Try it out it is quite easy. Brian.. You can say "Told you so!" Here is where it at this stage. I should perhaps try to blend the basecolor with the brightest part of the tank as you guys informed me to do! Or could I leave it be and try to blend it with washes/filters? Do note that I want to be at the stage where I can say "OK, this is finished. Let's move on to the other gazilion models I have planned"
Added a few layers of extremley thinned panzergray, decals and a layer of a clear coat. I think the problem you've been having with preshading comes from the fact that the Vallejo paints are very opaque, so they don't leave enough of the preshade showing. I usually use Tamiya paints and dilute 60-70% with thinner so I can build up the intensity of the colour gradually to a shade that I am comfortable with. Also remember that the model will always darken after filters and washes so you actually WANT a pale shade of the colour you desire at the end. That is probably the case and you need to thin them down more. Dottore wrote: I think the problem you've been having with preshading comes from the fact that the Vallejo paints are very opaque, so they don't leave enough of the preshade showing. I usually use Tamiya paints and dilute 60-70% with thinner so I can build up the intensity of the colour gradually to a shade that I am comfortable with. Also remember that the model will always darken after filters and washes so you actually WANT a pale shade of the colour you desire at the end. Yes, that's the case. I need to dilute them! Here's where I'm at. I need to clean up the washing some and then start with the chipping. I've cleaned it up a bit and took the drop into the deep end of the pool and gave my it my first shot at chiping. Please come with constructive criticism! Since I can't share a beer with you guys every Wednesday I'm counting on the forum for feedback! And not the way I've done it by having the dark colour to enhance the light chipping? And I'm trying to listen and not to do the mistakes you are warning me about! I'll go over the model again and this time add more dark chippings on the already lighter areas! On a different note, I'm a memeber of the local IPMS club here in the south of Sweden and on their forum all the comment are "Oh, that's nice" or "How lovley" and so on, even if the model looks like crap! That's why I miss the wednesday meetings, were the truth were told! What I ment to say is that the local Swedish IPMS forum is to nice and don't have the balls to give some constructive criticism, not like you guys! Anyway, I've tried to rough it up and add more chipping and pigments. I also think that you need more washes, this time controlled, with a thin brush around the detail. I would not use black this time, try another colour maybe raw umber. Some of the chipping particularly on the upper face of the turret and tank is still only light coloured, you need to touch it up with the dark grey or whatever dark colour you are using. 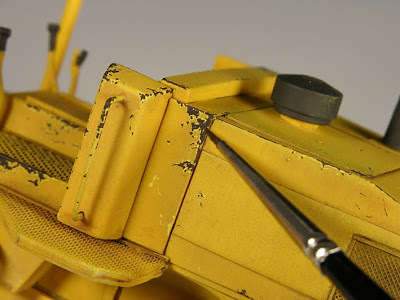 I thnk that all the sharp edges or corners should be chipped and then also the flat surfaces which would really be walked on, like the area around the turret, where the crew would get in from. You might be on to something here, I might have been blinded by the fact that I wanted to do some chipping, without referencing the image. So you are quite right Ivan. I think I might stop here and mark this as the first completed model. And then use this as a reference on what techniques I need to practice some more. I'm going to dust up the wheels, lightly, and add a few oilstains on the hubs and also on the enginedeck and call it finished. My hat off to all of you for all the guidance so far!